16:00~18:00 Registration and Meet-up Runners will need to register according to their registration number provided by the event organizer; get the souvenir, store personal belongings and gather at the race area. 17:00~17:20 Opening Ceremony（21K） There will be a pep rally, introduction of VIP guests, opening remarks and overview of race rules and regulations. 17:25~17:35 Aerobic Warm-up Professional trainers will lead the warm-up session. Elite Run [ 21K ] Runners in the 21K Elite Run must put on runner's vest, race bib and timing chip provided before dividing up into respective race groups. Each group will start the race at different times. All runners must finish the race within the time limit of 180 minutes. 17:55~18:05 Opening Ceremony（10/5K） There will be a pep rally, introduction of VIP guests, opening remarks and overview of race rules and regulations. 18:05~18:10 Aerobic Warm-up Professional trainers will lead the warm-up session. Campus Run [ 5K ] Runners of Glow Run, Love Run and Campus Run must put on the runners’ vest, race bibs, timing chips. (Love Run and Campus Run does not use chip timing) Runners from each group will start the race at different times (Glow Run and Love Run and Campus Run) and must finish the race within 100 minutes. 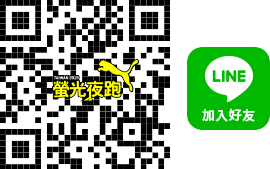 17:40~20:40 PUMA Night Run Runners will run according to the designated route and redeem souvenirs at the venue. Professional trainers will lead the post-race workout session. Awards ceremony / PUMA Night Run raffle drawing. According to the government specification, when the Air Quality Indexis up to 100, the organizer will announce the following contingency measures: All the runners can evaluate own condition and decide whether to participate PUMA Night Run. If they decide not to attend, the runners can straightly go to “gifts for race completion” for redemption only with runner bibs, and can still attend to the activities of booth area. There will be storage zone for personal belongings in venue, participants must use the red storage bag of Chinese Taipei Road Running Association or the PUMA Night Run Deck Gym Sack. The service will be open in the time period: 16:00-21:00, and might be flexibly adjusted due to the condition of site. The service will close by ten minutes after the stage performance, please be sure to have your belongings back before PUMA Night Run raffle drawing.